An electric Kia Picanto has been shown at a few shows around the world, but it was a concept. The world is still waiting for a production electric car from Kia, and it will have to keep on waiting. Even after today’s announcement about the Ray. The Ray is a production model that is not exported. It’s a city car for South Koreans, with a 1.0-liter gas engine, which was launched barely a few weeks ago. Kia has announced the development of an electric version, which will be built in 2,500 copies but none will be sold. Their only purpose is to make an experiment. 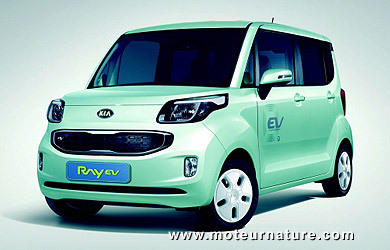 The same way BMW used with its Mini E. The difference is that electric Rays (that sounds impressive!) won’t be leased to individuals. The South Korean government and its various agencies will get them all. We guess Kia will learn a lot, but we ignore what’s coming next. Look wise, it seems good and its front design makes it look very cute and it has an attractive rear design too.